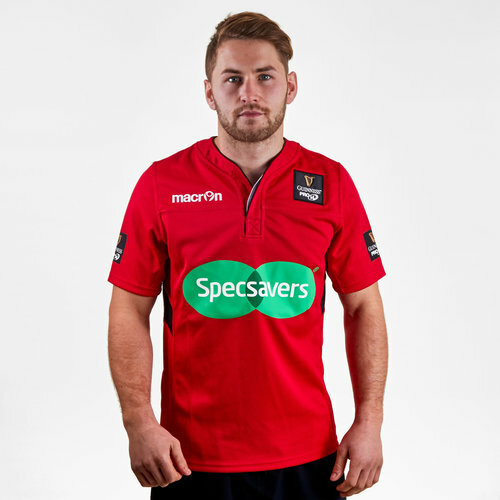 Take control of the action just like any top-level referee with the Macron Pro 14 Official Referee Playing Rugby Shirt which comes in Red and Black. Experience life on the pitch behind the whistle and take control of the action when you pull on this Pro 14 official refereeing jersey which will help you stand out with the bright red and black colourway. Simple enough in design the Macron and Pro 14 logos are embroidered upon the chest. The jersey itself has been designed with Macrons resist combtex fabric which gives the shirt a strong and durable feel to it without being restrictive whilst also allowing air to filter in and out keeping the wearer cool and comfortable even in the heat of the action.